Many members of the Kotchoubey family would be active participants in Masonic lodges and Semion was no exception as he was from 1818-1819 a member of the Poltava lodge, “Love of Truth” / Любовь к истине. In additon he was a close firend of a number of Decembrists including M.N. Novikov (1777-1822) and we learned that during the interrogation of M. I. Mouravieff-Apostol / М. И. Муравьев-Апостол, that Semion was a member of the Malorussian secret society / Малороссийское тайное общество. As such he was ordered to be arrested on 18.01.1826 and was presented to the General Staff office in St. Petersburg on 08.02.1826. He was subsequently released on 21.02.1826 with the necessary papers attesting to his innocence. Among Semion’s many charitable gestures for which he is remembered today is the donation of his brickworks factory to the Order of Public Welfare / Приказ общественного призрения for the construction boom in the city at the turn of the 19th century. He donated funds to the building of the Governor and Vice Governor’s residences. In addition he donated 18,000 rubles for the purchase of a house that would be home to students from poor households. 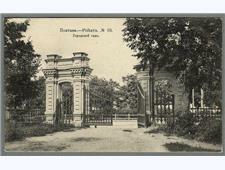 His garden was dontated to the city and an adjecent plot was purchased by Prince Alexander Kurakin to create what is today known as Victory Park. 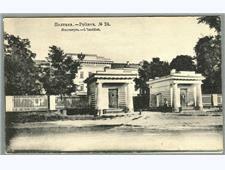 Semion sold his house ( a wooden structure) along with a forest and grasslands to the Institute of Young Ladies which was opened in Poltava in 1808. The value of the holdings was approximately 70,000 rubles for which Semion only accepted 50,000 rubles from donations by the local nobility. (source: http://www.doroga.ua/Pages/ReportDetails.aspx?ReportID=1452) He also donated his mineral collection (a passion that his distant nephew, Piotr Arkadievitch (1825-1892) would carry on with his own collection). In turn Semion paid the fees for eight pupils of the gymnasium. He held his post as Marshal of the Nobility of Poltava until 1805. He and his wife were survived by their son Nikolai who suffered from severe mental illness (see: http://rosgenea.ru/?alf=11&page=4&serchcatal=%CA%EE%F7%F3%E1%E5%E9&radiobutton=4) and died in 1870 where he lived his whole life in Ponurovka (Starodybovski region). Semion made provisions for his son’s care but he was able to spend all his money before his death and having given away his family’s vast fortune, he died without a kopek to his name. He died in Beliki (Mirgorod district) and was effectively with his surviving son, the last of the Semionovitchi line (the senior branch of the family) which counted among its forebearers, an acting-Hetman, a governor of Chernigov and another tie to the famed Bezborodko family. Семен Михайлович, вахмистр Конной Гвардии (1798); Полтавский уездный предводитель дворянства (июня 1802 – сент. 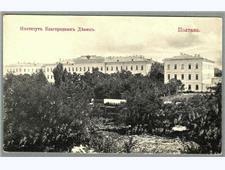 1805); надворный советник, Полтавский губернский маршал (1803-1805); действ. статский советник; имел 7000 душ; † 29 апр. 1835, погребен в с. Жуках. Ж. – Прасковья Яковлевна Бакуринская, род. 1784 † в февр. 1815 г.; дочь тайного советника.